Part of Eddystone specification for Bluetooth Low Energy is sending telemetry data such as temperature and operating voltage of the Beacons. The data is stored in big-endian format (MSB first, Motorola). The example below shows the programming of a sketch for the RFduino. The program is sending the TLM frames not permanently, but rather alternately with Eddystone URL frames (Interleaving Telemetry). Setting the advertising data and starting and stopping the Bluetooth stack is thus outsourced to the function advertise(). The main loop in loop() calls then advertise() alternating with URL and TLM data. In addition, this part takes care of the acquisition of the measured values for temperature and battery voltage. The functions ulong2adv() and so on are responsible for the conversion of the measured values into the format required for Eddystone TLM. 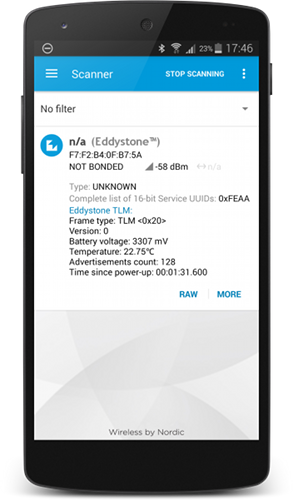 To receive and test the Eddystone frames you may use, for example, a smartphone with Android 4.4 or higher and a corresponding app. The figure shows the reception of an Eddystone TLM frame with the nRF Master Control Panel of Nordic Semiconductor - a very useful tool for developers of applications for Bluetooth beacons. * RFduino as Eddystone TLM beacon.